HIS sobs rang across the red, parched graveyard. "That's my son, my baby," moaned Paul Shillingsworth, as the tiny white coffin was lowered into the ground. "Don't worry, your Dad loves you." His mother, Rachel Pfitzner, 26, has been charged with his murder. Her family did not attend: they held a private memorial service in Campbelltown. Several hundred people gathered in the central western town's community hall, including many who had made the journey from Sydney and Tamworth. They included Paul Shillingsworth and his brothers and Dean's grandmother, Ann Coffey, who was his legal guardian. Dean's aunt, Sharon Dykes, delivered the eulogy. "How can you talk about a lifetime with someone so small?" she asked. She said the family was feeling shock, disbelief, and anger as well as compassion. But they were starting to accept his death. "This morning his spirit is here with us in the hall," she said. "And his spirit touches each and every one of us." Another aunt read a message from Dean's half-sister, who had met her little brother only once. "I know he will always be watching over me," she wrote. "When I look up to the night sky I know Dean's will be the biggest and brightest star in the sky." At the end of the service, Dean's father laid his head on the coffin and wept. His family followed the hearse in a procession through town to a dusty, windswept cemetery on the outskirts of town. Shops along the main road closed and their staff stood outside as a mark of respect. There, Mr Shillingsworth and his brothers took off their crisp, white shirts and draped them over the coffin to create a blanket for the little boy. 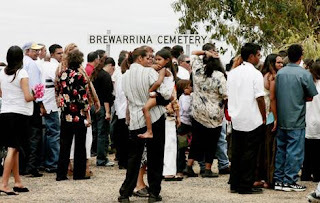 Dean's was the third funeral in a week for Brewarrina. One young man died of a heart attack, and an older woman died of cancer. "We have more funerals than we do weddings around here," said one local. "Bre", as the locals call it, is small. There are one pub, one RSL and an old Greek cafe, decorated as it was when it opened in 1926. It is reputed to be rough, but has calmed since the Aboriginal community worked with police to agree to curfews on alcohol sales a few years ago.